A huge thanks goes to @rosiekerr for hosting the last WWYD round. It was so much fun and so I really want to thank everyone who participated and then voted at the end. I had no idea I would win and find myself here and hosting one myself as this is the first year I’ve entered competitions. So here goes, announcing WWYD180. I was out in Western NSW last week and flew in to Dubbo airport. When I saw this building I wished I had taken my camera travelling (it was a business trip), as I immediately thought, that would be fun to give to people to play with. I would like you to know it was not easy to get close to this building to get the photo and I had to walk a roundabout way and take this through a big security fence. I kept hoping I just looked like a tourist with a phone camera, and not a security risk! All good, no one grabbed me for questioning. Ever since I was a small child I have held this service in the highest reverence, so you might enjoy to read about them as you think of WWYD with the image. Maybe you will add in things that tell about the service, or maybe you will just go wild with some ETSOOI like I did on the last challenge and turn it into something else entirely. 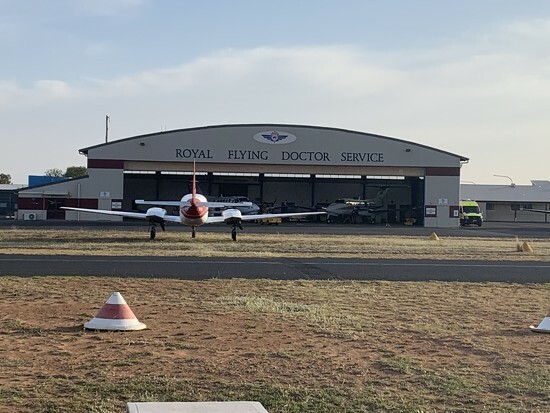 The Royal Flying Doctor Service of Australia is one of the largest and most comprehensive aeromedical organisations in the world. It provides emergency and primary health care services for those living in rural, remote and regional areas of Australia. This is not an air ambulance, but a flying medical service. •	Go wild with any kind of editing techniques you like – anything goes! You can keep or not as much of the original image as you like. •	Come back and add to this discussion thread to get it lots of exposure. (to add your image in a reply click on the arrow near your fav and comment numbers on the image and copy the “embed” code, then paste in the reply. •	You can enter as many variations of this image as you like. This challenge is a great way to try out editing techniques you have not tried before. Sit back, relax and have lots of fun with things like: horizon straightening, tone, colour controls, cures, details, sharpening, gradients, filters, layers, dodge and burn, masks and textures. Try out different apps and online tools, but remember to just have FUN! aaaahhhh one for every colour perhaps ;) It's going to be so interesting to sit back and watch this one unfold!